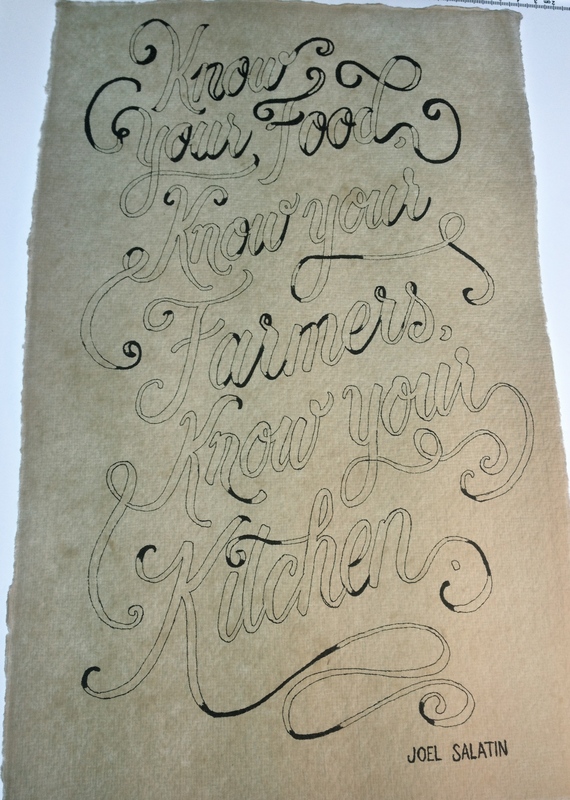 This time around, I decided to go all out for the hand-lettering piece for the restaurant die wilderin. 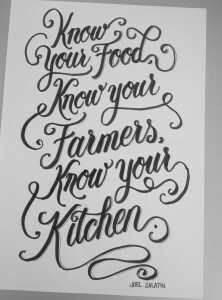 The quote I went with, to me, characterizes exactly what die wilderin does – they work closely with their suppliers, farmers, and know their food by name. Literally: the meat on the menu is not only described, but also named by its given name as an animal. 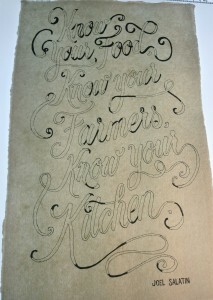 The basis for this piece was calligraphy. 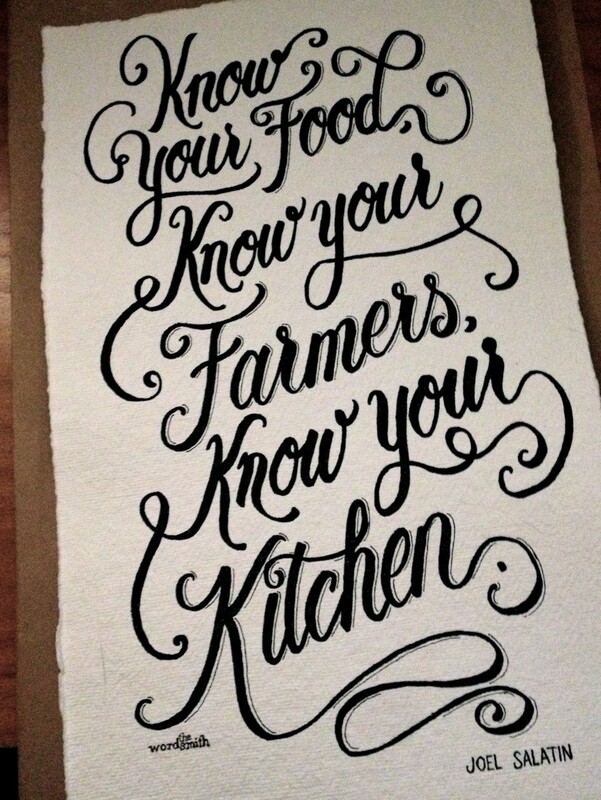 I wanted to balance the wording of the quote, placing the same weight on “food”, “farmers”, and “kitchen”. 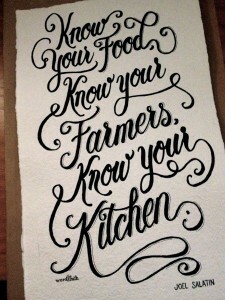 However, after playing around with the quote a bit, I wasn’t happy with the balance of calligraphy and wording. So I decided the whole quote should be calligraphic. After I had drawn the master with a Tombow brush pen, I moved on to the next step: tracing the piece onto the hand-made paper I work with for the die wilderin quotes. I prefer using Staedtler pigment liners from 0.1 to 0.8 mm. At this point, a calligraphic piece turned into a lettering piece. I traced the outline of the words before filling them in. At this point, I discarded the master, working free-hand on the piece. I started with the narrowest parts first, before filling in all the letters and swashes. 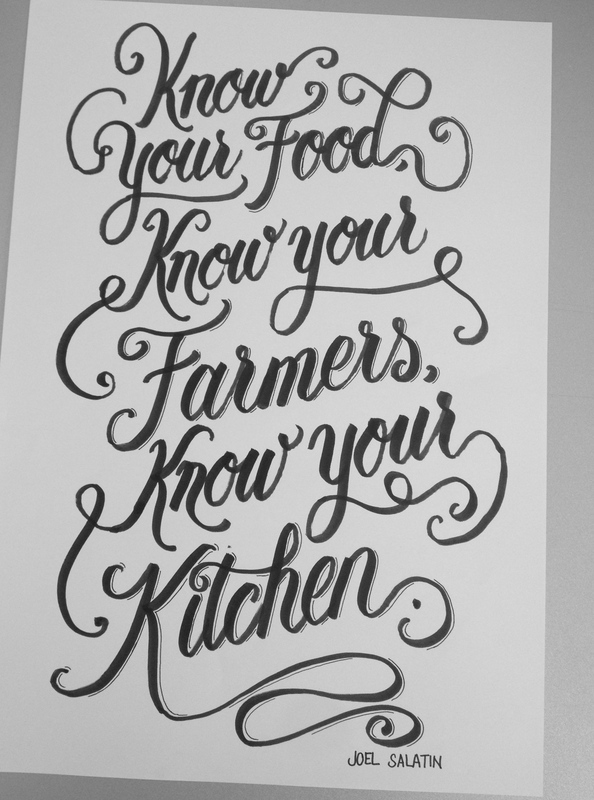 After this step, I balanced out certain strokes and letterforms, and added the shadow to the most significant words, “food”, “farmers”, and “kitchen”. 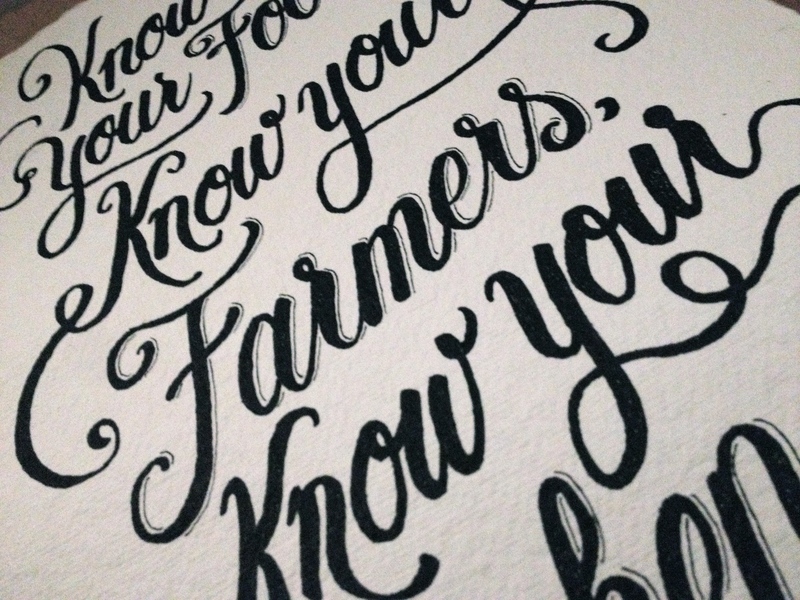 One thing I always underestimate is the amount of time it takes to letter a piece. Choosing the quote took me a week; deciding on the form and layout of the piece took me another two weeks. 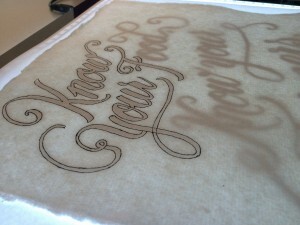 Working on the calligraphy also took about a week, and simply tracing and coloring the piece took almost two weeks. Of course I don’t work on the piece 24/7, but still, the process keeps me occupied for weeks before I’m satisfied with the piece. I guess this is the way I work, though – slow and steady wins the race. Especially if I can go to die wilderin for refreshments in between steps to keep my spirits up.